Russ Hartzell, FWP’s northwestern AIS supervisor, holds a temperature gage to make sure the water is hot enough to kill mussel larvae during a preventative procedure. Watercraft passing by the inspection station must stop. 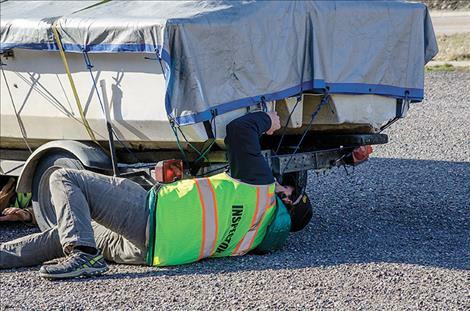 CSKT AIS Program Coordinator Eric Hanson looks under a boat for invasive mussels. A kayak goes through the station where all watercraft are required to stop. 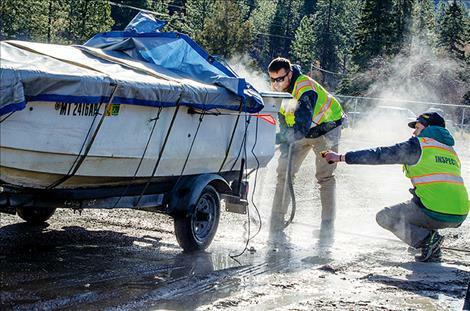 An inspector washes a boat on Friday at the Ravalli check station with 140 degree water. 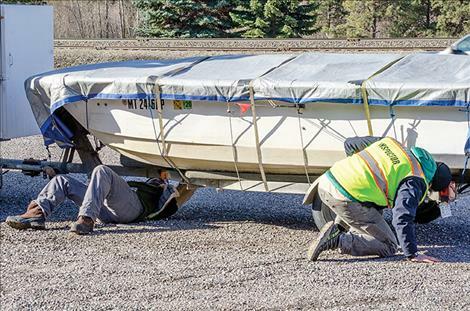 RAVALLI – Efforts to keep invasive mussels out of Flathead Lake are in full force again this year as watercraft inspection stations opened in Ravalli, Blue Bay and Kalispell last week. Montana Fish, Wildlife and Parks and the Confederated Salish and Kootenai Tribes are teaming up and doubling the efforts to keep invasive mussels from covering every hard surface in the lake with razor-sharp shells. 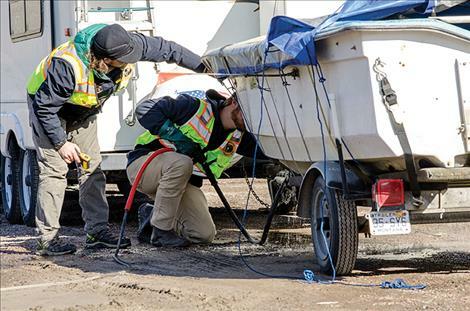 Vessels traveling into the Flathead Basin are required to stop at inspection stations to make sure they aren’t carrying any aquatic invasive species. 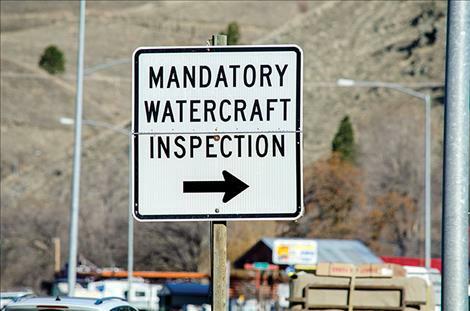 After being inspected once, watercraft don’t need to be inspected again unless they leave the basin. 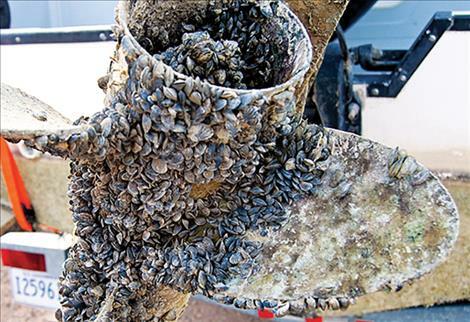 According to CSKT AIS Program Coordinator Eric Hanson, it’s not too early in the year to start worrying about zebra and quagga mussels coming into the area. “We’re concerned people coming back from the southwest – where it’s warm all year long – could bring in live mussels,” he said. He added that those warmer southern states have lakes with well-established invasive mussel populations. The issue becomes even more urgent every year as the invaders spread across the country. Invasive mussel larvae were found in Montana a few years ago when the Tiber Reservoir tested positive. Canyon Ferry Reservoir and Missouri River near Townsend both had water samples suspected of mussel larvae, but adult mussels haven’t been found in the state. Viable treatment options are not available at this time, although efforts are being made to find them. 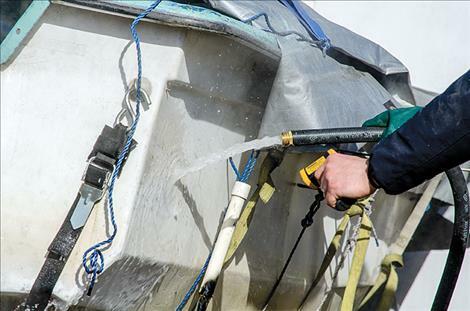 Prevention is the only current solution to keep un-infested waters mussel free. 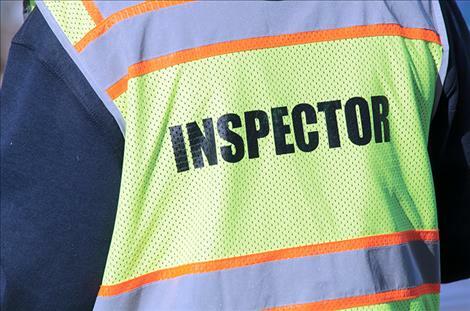 Inspection stations are the main prevention method. On Friday in Ravalli, boats lined up for a quick inspection one after the other on their way to the lake. Inspectors asked where watercraft including boats and canoes had been, and where they were being taken. After a visual inspection, a receipt was written as proof of inspection. The inspection station for the south side of the Flathead Indian Reservation will remain at Ravalli this year, and it won’t be in Pablo. Russ Hartzell is FWP’s northwestern AIS supervisor. He was at the Ravalli inspection station, which is managed by both FWP and CSKT, to help out on the opening morning. “We are doing everything we can to mitigate the risk for AIS in the state,” he said. The tribe’s program coordinator and the state supervisor approached several boats together, crawling under them at the same time, looking over every surface for any sign of mussels. They checked for anything that might carry an invader like plants, animals, mud, or water. One of the boats that stopped in was coming back from Arizona, a state with a well-established invasive mussel population. The team didn’t find any mussels on the boat, but they asked the owners if they would agree to a voluntary “hot-wash” procedure because mussel larvae are microscopic creatures and it’s better to be safe. 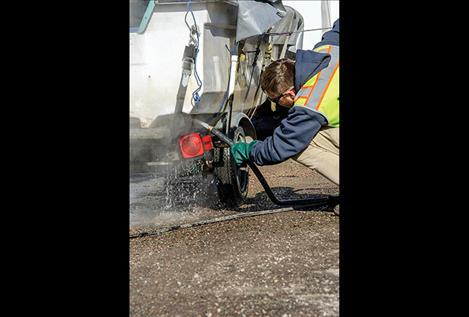 “Any time a boat is coming from out of the state, we like to do a hot-wash if the owners will let us,” Hartzell said. Hartzell followed the boat with another inspection station crewmember to a large tank where hot water was heated on sight. “Water at 140 degrees will kill the mussels after 10 seconds,” he said while holding a temperature gauge to test the water. The boat was cleared and sent on its way. If mussels are ever found, arrangements are made to have the vessel decontaminated and kept out of the water for a certain amount of time, which is specific to weather temperatures and the fact that mussels can survive for 30 days outside of water. 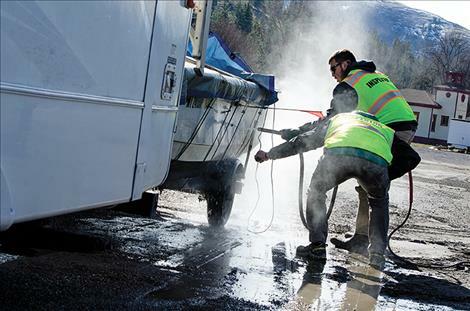 “It’s extremely important to ensure the decontamination is done right, so a crew will clean the boat at no charge,” Hanson said. 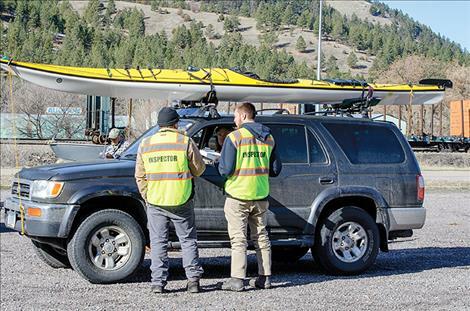 Anyone carrying or towing any watercraft or water-based equipment, non-motorized and motorized, must stop at all open watercraft inspection stations they encounter in Montana, according to FWP. 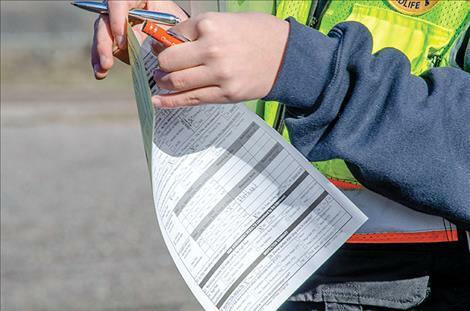 If people fail to stop, local police departments, the Lake County Sheriff’s Office, FWP game wardens, Montana Highway Patrol, tribal officers and tribal conservation officers will work together to respond to calls involving the check stations. FWP and CSKT are asking for the public’s help in the battle against AIS. 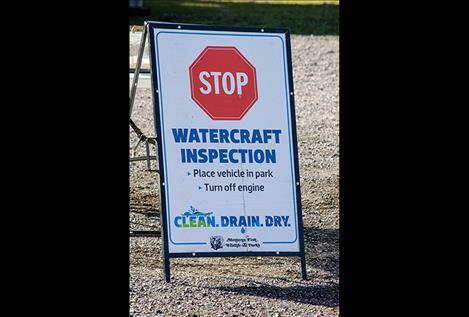 People need to stop at inspection stations and follow the “clean, drain and dry” message for all watercraft after they are taken out of any water body. 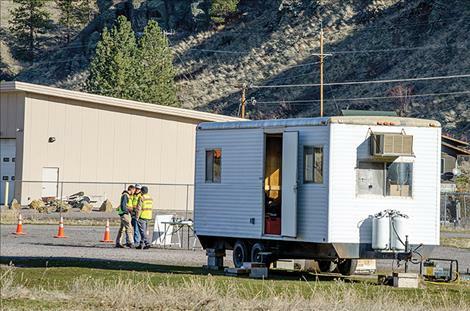 If stations are closed, an inspection can be arranged at CSKT offices at 406 Sixth Ave. E. in Polson, 7 a.m. to 5 p.m. Monday through Thursday. Call 406-675-2700, ext. 7280 or 406-261-6515 to arrange a time. CSKT is requiring all watercraft used in Spring Mack Days to undergo inspections. 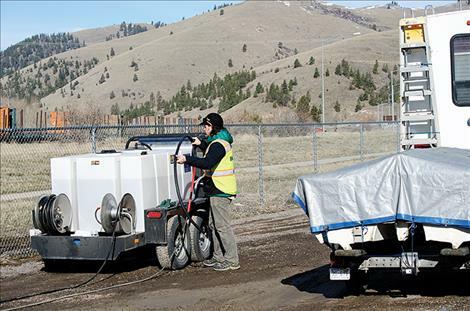 For more information about Montana’s efforts to defend against aquatic invasive species, visit cleandraindrymt.com and the “Protect Our Waters Montana” Facebook page. For more information about the CSKT AIS prevention program, visit CSKTnomussels.org.